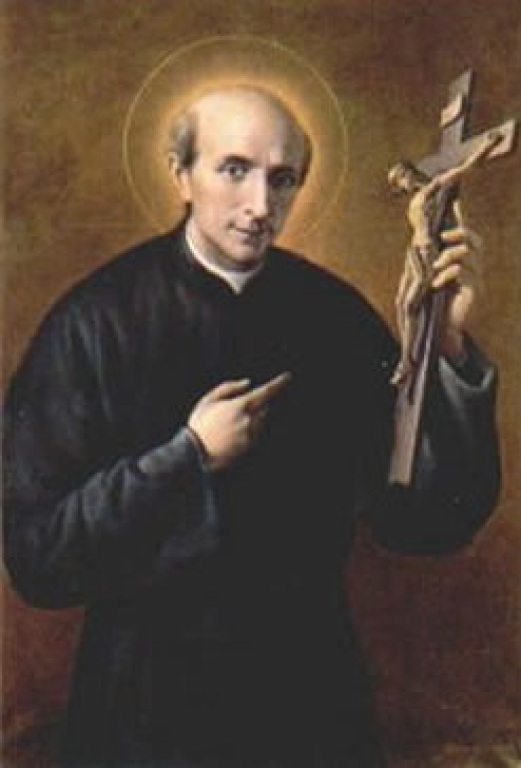 St. Vincent Pallotti was born in Rome, April 21, 1795 to Peter Paul Pallotti and Mary Magdalene De Rossi. He was the third child of ten. From his earliest years his devout parents took him to daily Mass and religious devotions in the many neighborhood churches of Rome. For a time Vincent had trouble with his studies until his mother sought the advice of a close friend, Father Fazzini. He advised her to make a novena to the Holy Spirit with Vincent. The Novena completed, something clicked in the boy's head. He became the brightest student in his class. Vincent had an innate desire to do what he could to help the poor. Before he would give them a coin he would wash it in the nearby fountain. "When I give to the poor," he would say, "I give the coin to Christ. I want it to look nice." He felt called to do penance. He ate little. When his parents informed Father Fazzini of the penances, he replied, "Let us leave Vincent undisturbed. It appears to be a higher call than we have been given. It seems to come from God." Vincent's first registration in a religious youth group was at his grade school of San Pantaleone, staffed by the Piarist Fathers. 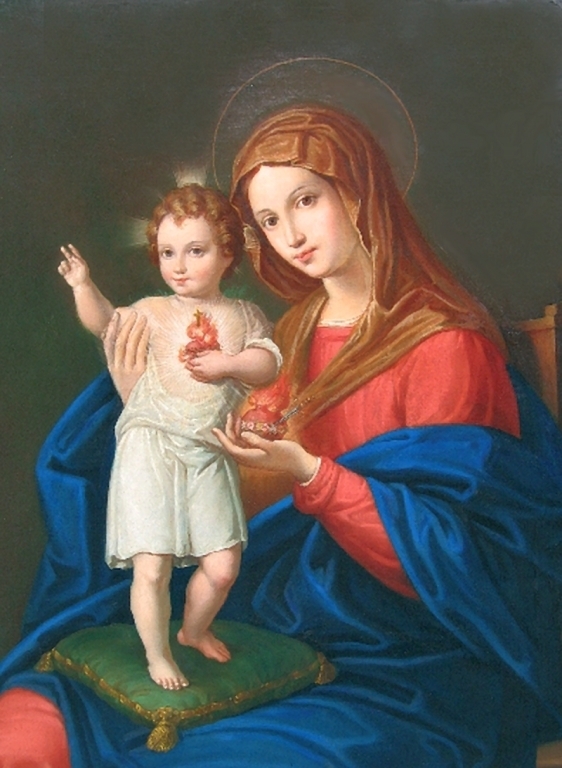 Vincent's Marian development was well nurtured in this school with the solemn observances of our Lady's feasts and the devout use of a small rosary of twelve Hail Mary's called the "Crown of Twelve Stars". Vincent was quite religious and of a serious nature. Yet, he loved to play ball with his friends; however, early every morning he walked to Santa Maria in Vallicella. There he put on his cassock and surplice as an altar boy. Under the altar of this church there were the reposed remains of the great youth worker, St. Philip Neri. 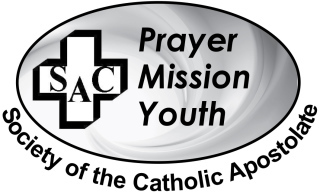 In the days before St. John Bosco, the name of St. Philip Neri would first come to mind whenever any program was being instituted for youth. Pallotti was often referred to in later life as the "Second St. Philip Neri." Vincent's high school studies were accomplished at the world-famed Collegio Romano which had been established by St. Ignatius Loyola. In Vincent's time the Jesuits had been suppressed for several years and replaced by other clergy. The profound tradition of the Jesuits who had taught there, and the magnificent altar tomb of St. Gonzaga, could not be ignored and was very much kept alive. 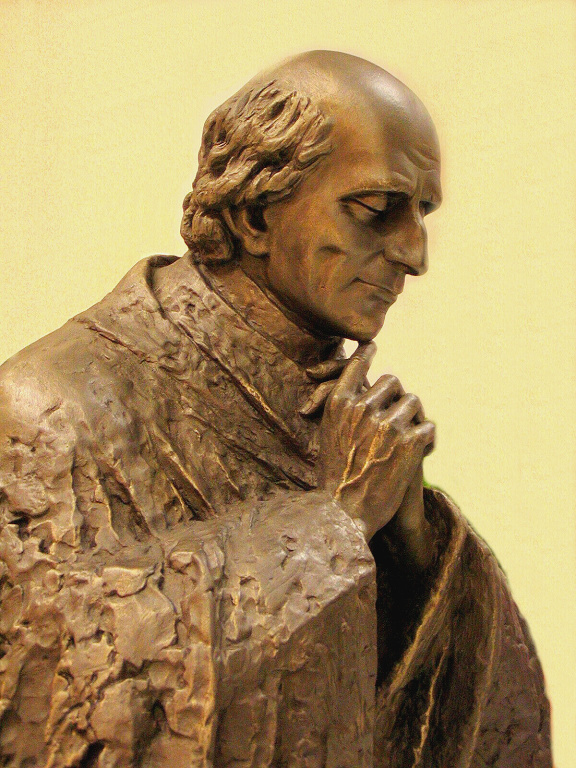 Pallotti chose St. John Berchmans, a Jesuit seminarian, as his role model to imitate on the path to holiness, particularly in his love for Mary in her Immaculate Conception. Collegio Romano, as all Jesuit schools once did, had a distinctive youth organization known as the "Sodality of the Blessed Virgin." Because the school's unit was the first Sodality, it bore the distinguished title: "Prima Priaria." Vincent cherished his membership in it and the group heightened his Marian devotion all the more as he practiced it in union with his peers who took their devotion to Mary very seriously. After his entrance into the Sapienza University as a theology student, Vincent decided upon a very bold and daring move. Despite the very negative reaction of many toward the clergy, now that he was a seminarian, he chose to wear his cassock and collar in public. He was clearly visible as a man of the Church when most diocesan and non-monastic orders wore regular garb. Vincent Pallotti was ordained in May 16, 1818, at the Lateran Basilica. He said his first Mass on the following day in the Jesuit Church in Frascati. He was not assigned to a specific church or rectory. Instead, he lived at home with his family and continued as a teacher at the Sapienza University. In the world of college students he was very well liked. He offered tutoring to those who had found their studies difficult. 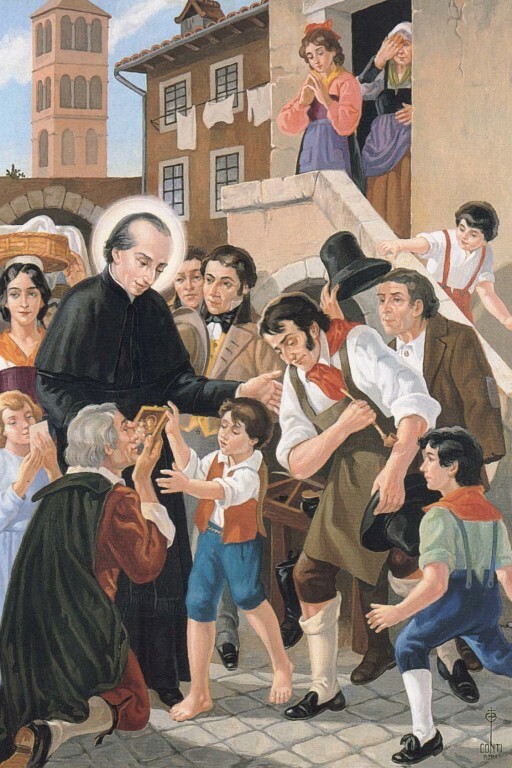 He began a very successful apostolate of street preaching on the steps of local churches and was able to attract large numbers of people into church afterwards for confession. After ten years at the Sapienza University, the diocesan authorities turned to Father Pallotti for assistance with a very pressing youth problem in Trastevere. This section of Rome was a difficult one. While it had produced saints as lovely as St. Cecilia and St. Frances of Rome, it had also produced many rogues and toughened people. There was a great need for a kind, patient and sincere priest who could see beyond brokenness and be capable of drawing the best out of these disorderly youth. They needed to be given the most elemental religious instruction and needed to be prepared for First Holy Communion. This new assignment would mean relinquishing his teaching position at the University and saying goodbye to his favorite youth group at Santa Maria del Pianto. 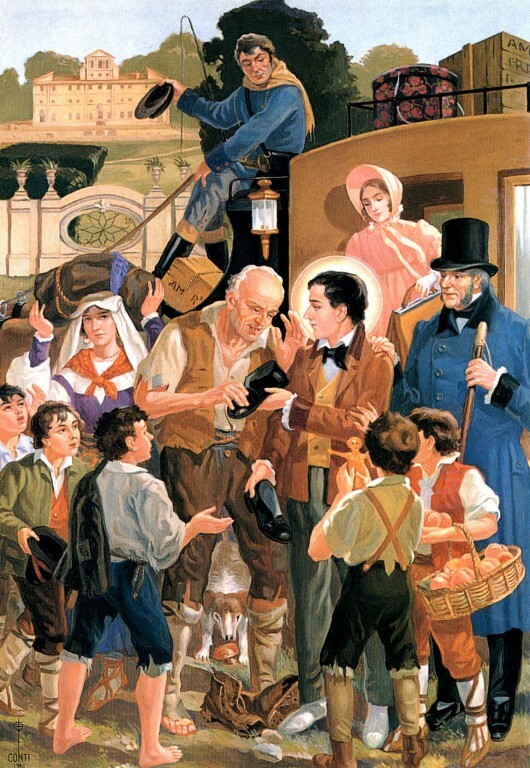 Father Vincent knew that the assignment would bring many souls to God and strengthen the faith of these Trastevere urchins and so he accepted it willingly. He was given space in the Ponterotto retreat house which had formerly been the family home of St. Frances of Rome. The rough Trastevere teens now got the attention they deserved in order to set them in the right direction. They responded with extraordinary cooperation. Pallotti did not neglect the nobility nor the upper class and he provided retreats for them at another retreat house nearby. His purpose was to inculcate into these men who would be the leaders of the future, a love of virtue, a sense of honor and integrity coupled with a sense of responsibility for those who had less than they. His knack for getting volunteers involved in his many projects, expanded beyond his concern for youth when he began to broaden his vision of the Union of the Catholic Apostolate (UAC) which strove to accomplish a revival of the Catholic faith among Catholics and a rekindling of charity toward achieving the salvation of one's neighbor. Vincent's vision was that men and women of every social strata, church folks of every rank and religious order would work in harmonious collaboration for the missionary endeavors of the Church. Moreover, the poor, the aged and ailing, the sick and bedridden, could offer their prayers and sufferings for the success of the venture. Pope Gregory XVI heartily approved the new movement and it soon had hundreds and hundreds of members. Not long after its foundation, deadly cholera struck in 1837 and decimated the population of the Eternal City. Not even Vincent's father was spared. In its wake hundreds were left homeless and hungry. Orphaned girls roamed the streets .What grieved him most was that these orphan girls were being taken advantage of by the unscrupulous. It was their pitiable plight that wounded the heart of Vincent Pallotti who was strenuously working day and night and round the clock to care for the destitute and abandoned. He and a trusted friend, Mr. James Salvati, obtained the use of a small, former seminarians' residence and fixed it up to receive the orphan girls. This home became known as the Pious House of St. Agatha. It is still in operation today behind what is now the St. Thomas Aquinas University in Rome. In its chapel Vincent placed the large painting of the Immaculate Heart of Mary. John Henry Newman, much admired by the young students of Oxford, had resigned his Anglican ministry and entered the Catholic Church. He and several others were sent to Rome to complete studies for ordination to the Catholic priesthood. Newman believed Pallotti to be a very holy man and said the same to the then Archdeacon of the Anglican Diocese of Chichester. Manning had come on visit to Rome to examine its claims "on location." He went to visit Pallotti and came away with the same conviction. Manning spoke of hearing a group of young men singing a Marian hymn as they passed through the street and was told that it was one of the groups from Pallotti's Night Schools on their way home. Both Newman and Manning later were made Cardinals of the Roman Catholic Church. Youth work was not the only part of Pallotti's apostolate though there is more than enough of it to merit a consideration of its own. He continued his duties as a diocesan priest and led his Union of the Catholic Apostolate in its generous outreach to provide for the local needs of the Church and for those of the foreign missions. He was a great retreat master and preacher. Long lines waited their turn outside his confessional. Yet Pallotti made time for daily visits to the city hospitals and to the jails and prisons where his smile and compassion brought a ray of sunshine to those incarcerated there. He badgered the prison officials incessantly until he had obtained the separation of the youthful offenders from the adults in prison. "If you want to rehabilitate youth and keep them out of jail in the future, then give them a chance without a thorough training in criminality they are sure to receive from their elders here!" He was listened to with respect by the prison authorities, and with gratitude from those who would now have a new lease on life. Only once is it recorded that his contact with youth was a failure. A group of loud, boisterous wise guys were standing before a picture of Our Lady and their language was not of the type one would expect to hear in a convent sacristy! Vincent went up to them and asked them to stop out of respect for the Blessed Mother's picture. The haughty braggarts who feared neither God, man nor beast, stood up to the young priest in the mistaken hope of besting him. The ringleader jeered: "Yeah, Father! What's she going to do about it, kill us?" Suddenly a look of horror came over Vincent's face as he saw into the near future. "Young man you are a fool to continue like this. You will be dead in less than a few minutes. Repent while there is time. At that the teenager let out a stream of profanity that would have twisted the tail of a stone lion. Suddenly he collapsed unconscious to the ground. The astonished following of juvenile delinquents rushed to revive him. They were shocked out of their wits. "He's dead, Father! My God, he's dead!" By use of a clever disguise Vincent was able to get near a young man who was a revolutionist and had promised to kill any priest who came near him. When the man fell asleep with rifle in hand and pistol beneath the pillow, Pallotti removed them and put the cross in his hand. Later the man awoke, astonished and made his confession to Father Vincent and died about a week later reconciled to the Lord. 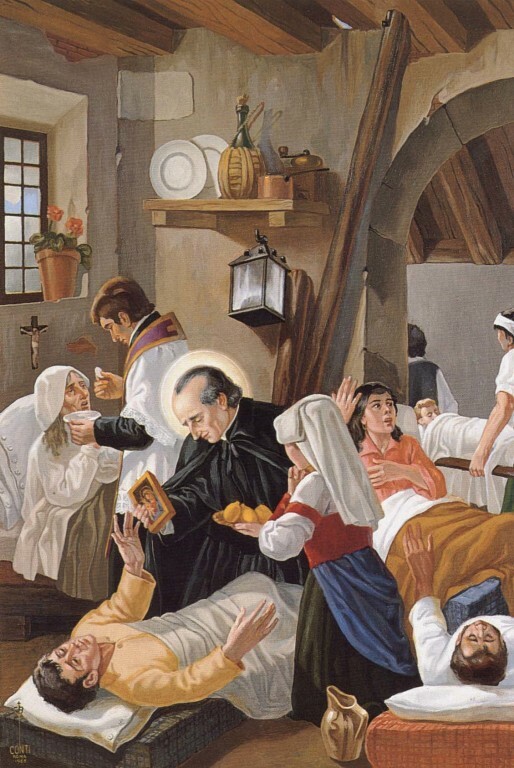 St. Vincent Pallotti died in 1850 surrounded by a handful of followers which now numbers thousands of priests, brothers and sisters and an even more vast number of lay people committed to the apostolate. Vincent's missionary zeal brought the Pallottines to the United States in the early 1880’s and to the Midwest Province headquartered in Milwaukee, Wisconsin in 1923. He was canonized in 1963 by Pope John XXIII as a model for all active priests and for encouraging the lay people to become more active in the mission of the Church. Also, he was hailed by Popes Pius XI, Pius XII and John XXIII as the precursor of Catholic Action and of the Second Vatican Council. WE ARE ALL CALLED TO BE APOSTLES OF CHRIST!